This year’s BETT show hosted a wide range of companies offering the very latest in ICT for schools and education. However not everyone gets to visit the show so Adam Kirby and Peter Hack from Mirus descended on London’s ExCeL to find out what was all shiny and new for 2014. Adam & Peter’s goal for the day was to speak to as many relevant companies as possible to find out what technologies would be entering the classroom this year. Amongst all the people they spoke to, there seemed to be an underlying theme as to where the industry was heading. That theme was based around what many of them described as “the classroom of the future”, to put it simply, new ICT devices and infrastructure that will change the learning environment as we know it. As you can imagine there were a lot of buzzwords flying around but “VDI” (Virtual Desktop Infrastructure) seemed to be the most common. Judging by what they saw on people’s stands, it’s clear that VDI is the next big thing for the classroom. Put simply VDI is a technology that enables Teachers and Students to access their own personal desktop from any device across the school with the backend all being hosted by a server or a cloud infrastructure. We’ll explain this in more detail later! With this in mind Adam and Peter quickly realised that there were many accompanying products and services that will work alongside these types of new technologies as enablers. There are some really exciting and simple tools out there that will make any ICT Heads life easier. The timing of the BETT goes hand in hand with procurement and project planning for schools, so Adam & Peter wanted to share what they thought were excellent products and services that will create the “classroom of the future”. When it comes to primary schools, devices and solutions often have a simple front end, making it easy for young students to learn and enjoy technology at their fingertips. A lot of the companies we saw were offering some very innovative technology, but one company stood out for us in what and how they were presenting, that company being LearnPad. LearnPad are a manufacturer of tablets for education, offering a wide range of different products. 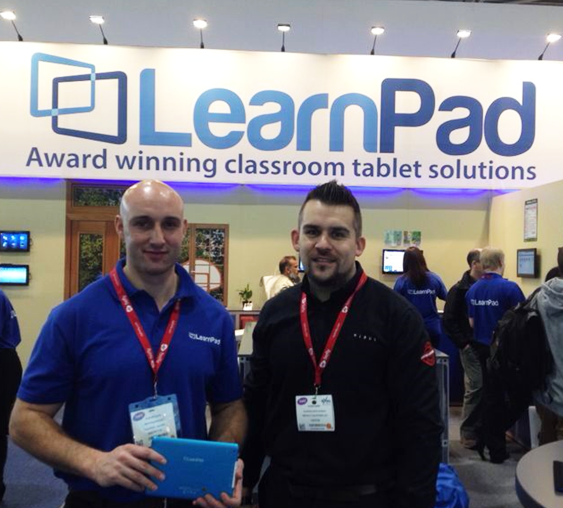 Think Apple’s iPad, think easy management, and think virtual learning and apps, that’s what LearnPad do. Huw Williams Marketing Director at LearnPad showed us the impressive and powerful management tools working live on multiple devices. LearnPad allows a whole new area of engagement for very young children, even from the age of two. LearnPad's intuitive and secure user interface and touch screen means young children, previously unable to interact with PCs and content, can easily work with engaging content such as colour recognition, shapes and patterns, nursery rhymes and 'read-to-me' stories and animations. Additionally, using LearnPad at such an early age allows children to familiarise themselves with touch sensitive devices and technology, which will undoubtedly be a part of their future lives. LearnPad offer many different devices ranging from 7.85” mini tablets up to a whopping 13.3” large tablet. These tablets are very robust but host a unique operating platform that enables custom apps to be purchased from the online store, all based around the latest key stage learning initiatives. What was really impressive were the management tools called LearnPadConnect and ClassView. LearnPadConnect is a web based management portal that allows classroom teachers to easily control multiple LearnPads. You can remotely suspend or lock devices, view and display LearnPad screens, send new activities and profiles, and communicate with students - all from a single webpage. ClassView is a unique way to interact with students. You can connect directly to any LearnPad and view or control the device, even display it on the whiteboard at the front of class. You can monitor LearnPads from any PC, Mac, laptop or tablet, to ensure students are focused on the task you have set. You can also connect to remote LearnPads outside of the classroom, such as students in study groups in the library. ClassView ensures all students are on-task and facilitates the presentation and sharing of their work in the classroom. All in all LearnPad seem to be the dominant player in the tablet market for primary schools, on the day there didn’t appear to be anything that would contend with them and their unique management tools make LearnPad a market leader. Another major technology that goes hand in hand with devices such as tablets is mobile device management (MDM). MDM is a rapidly growing technology in the market and is fast becoming an essential tool when installing and support multiple devices. In schools, we see that initiatives such as Bring Your Own Device (BYOD) are becoming increasingly commonplace, bringing with them more challenges for security, network and management. AirWatch is a management tool that scales to support deployments of hundreds to thousands of devices through a robust architecture that is fully configurable according to your environment and requirements. AirWatch is built on industry standard technology, making it easy to manage alongside your existing enterprise applications. AirWatch can be deployed in a highly available environment and fully supports disaster recovery configurations to minimize downtime. Kelly Lyons, EMEA Account Executive for Education, talked to Adam about some of the unique features their product has, including application level control for things like Facebook and Twitter. 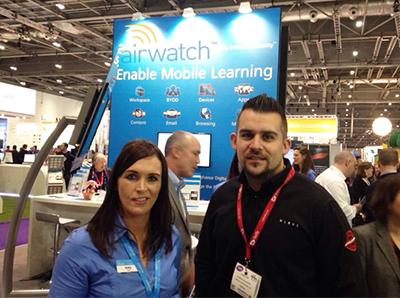 AirWatch is helping schools and universities embrace the next generation of learning with educational apps, eBooks and learning content on mobile assets. With AirWatch, you can track all mobile assets across your institution, configure policies and settings, distribute apps and secure access to school networks and resources all through our web-based console. 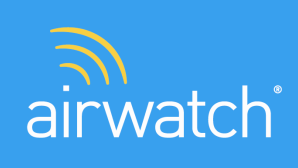 AirWatch allows IT administrators to ensure devices are compliant with school policies and monitor violations in real time. This empowers you to maximize your mobile investment by increasing IT efficiency and reducing costs associated with managing mobility. AirWatch is focused on the education sector, and has a dedicated team of account executives who understand the market, as well as an education specific R&D team. AirWatch also has strategic partnerships with industry leaders in the education market, including Blackboard and CDW-G. Education-specific pricing models and discounts are available. The ever expanding number of Mobile Devices being used in Schools is giving many Heads of ICT the difficult task of securing the wireless network and making sure that the performance of the network is good enough across all users. Legacy systems make this a headache… Aerohive on the other hand have totally changed the game! Aerohive simplify network management by offering an easy to use portal called HiveManager from which you can control all of the access devices across your school. We met with Stephen Hoy from Aerohive on the stand and he explained just how easy and clever their system is. 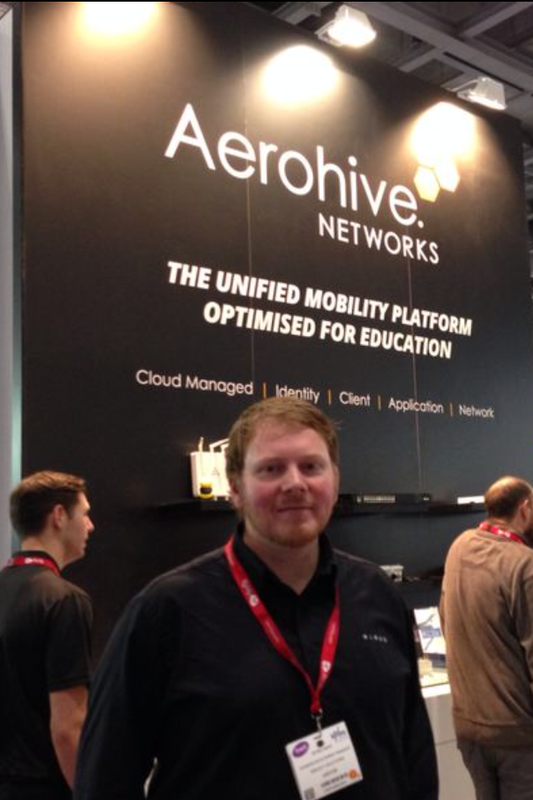 Aerohive explained how easy it is for Schools to put a secure mobile network in place. Peter (left) received a demo at the Aerohive stand of how it all works. The technology in the network means that a user device will connect automatically to the nearest wireless access point seamlessly whilst keeping the correct access levels. Aerohive have a long list of Schools and Colleges as part of their current client portfolio. Their technology is indeed a game changer and will allow a far better and safer experience both for the user and also the School. In the middle of a busy stand full of young children all working on some exciting mathematics problems we found television personality Johnny Ball smiling and teaching away. We managed to steal 10 minutes of Johnny’s time to understand his involvement and thoughts on Technology for Schools. 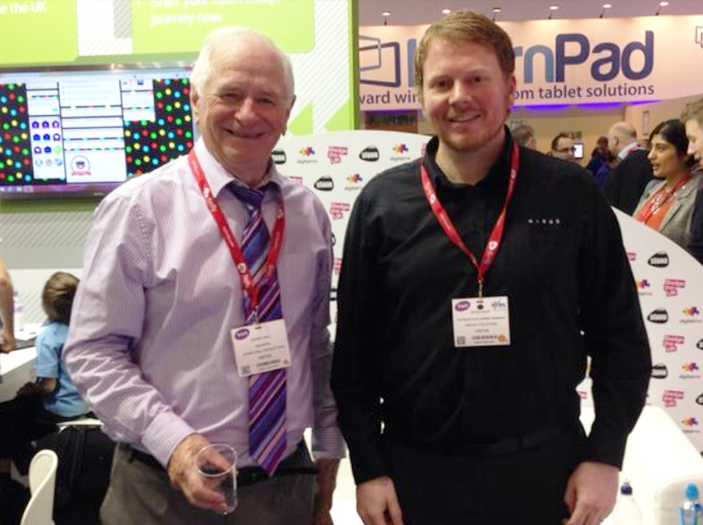 Johnny Ball, Television Personality & Mathematics Enthusiast, tells Peter how he believes that with the right technology in schools, children can learn more and have fun whilst doing it. Johnny is extremely impressed in the advances that have been made over the past 5 years and is excited about the new and interactive learning that is available to schools. He believes that it is important for schools to embrace new ways of teaching, to harness the attention that mobile devices, interactive screens, and learning tools such as learn pad offer. Johnny said “When children want to learn they will achieve far more, and the more we can do to help them the better.” He did however quote that the material being used needs to be educational and not 80% game. The idea after all is to learn! Johnny completed 3 seminars across the 3 days of the BETT show and received very positive feedback from a number of schools and technology developers throughout the week. We at Mirus to echo his thoughts, utilising the right technology to improve a child’s learning process is certainly money well invested. Many Schools and learning facilities are looking to include mobile devices as part of their classroom experience. The initial decision regarding the type of device and the applications and operating system that will be used are the first thought but then the attention moves to “How will we store, charge and sync the devices” – This is where Bretford come into their own. Bretford offer a wide range of products dedicated to mobile devices. From laptops to iPads they offer the solution that will allow you to store the devices in a secure place. 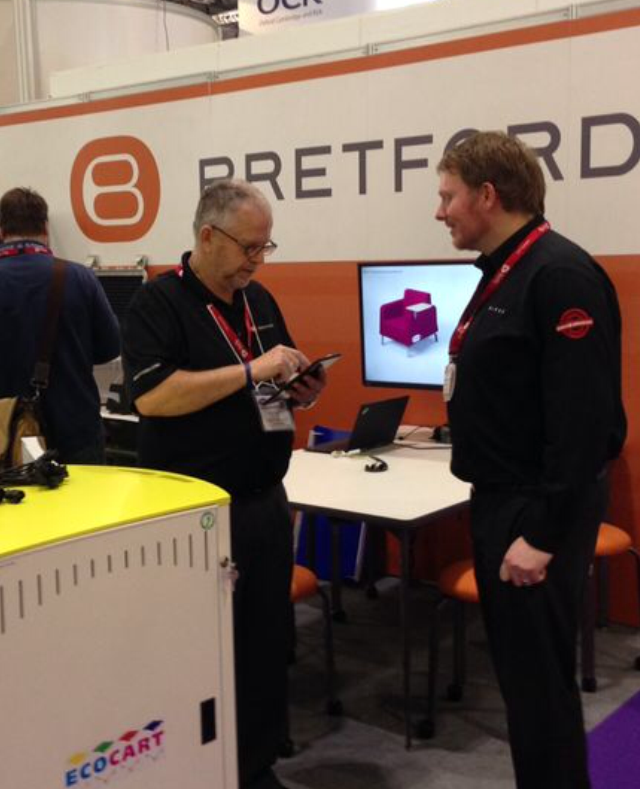 Michael Haggerty of Bretford shows Peter the latest in mobile device Carts. We spoke with Michael Haggerty – Business Development Manager – on the first day of the show. Michael demonstrated a number of their secure cabinets to us. The first he showed us was a called a PowerSync Cart for iPad. This Award Winning secure and lockable cart holds 30 iPads and charges each one simultaneously. A great feature of its design is that all 30 iPads can be connected to a Mac and can all by updated and synced to iTunes at the same time which cuts down maintenance time extensively. The Cart also works with Apple Configurator which means you can prepare and conform your devices according to your Schools needs. Finally the Cart is moveable meaning that it can be moved between classrooms easily – rather than having to take the children to the devices. Michael also showed us some great looking products designed for Laptops, Android Tablets, Chromebooks, and Macs. He also showed us two fixed Smart Locker solutions which allow students to securely swipe the devices out in the same way that you would a library book. The final product range we were shown looked fantastic for the Primary/Lower/Middle School environment. It was called EcoCart. The EcoCart is a lightweight, energy efficient, colourful Charging Cart which can store and charge up to 30 laptops. Although the cart holds up to 30 17” laptops the materials used make it very lightweight and manoeuvrable. Again this can be moved easily between classrooms making this the perfect addition to any ICT suite. We were really impressed with the passion and ingenuity of Bretford solutions and as a partner are proud to be able to offer their product range. If you are considering implementing mobile devices into your School – don’t forget a Cart! VDI – What is it? Many schools have turned to virtualization technologies for their servers and in their data centres to simplify administration and to reduce management chores and operating costs while maintaining reliability and safeguarding against disasters. Seeing the significant benefits virtualization delivers in those environments, schools are now looking to apply the same technology to their desktop computers. 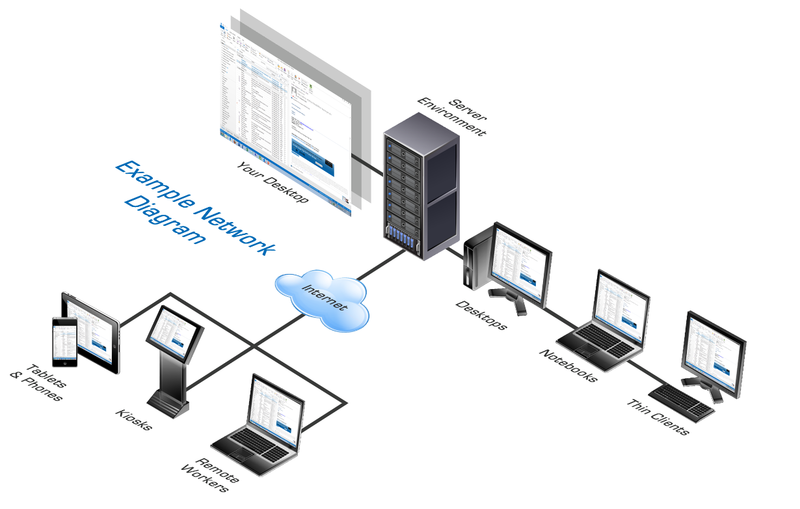 A Virtual Desktop Infrastructure (VDI) is a solution where your IT users are no longer tied to a particular device, instead they can use multiple devices to connect to a server based desktop session, allowing them to hop between devices and locations, all without compromising their productivity. The future of End User Computing lies with investment in new technology, to pave the way forward for a resilient, highly available and easy to manage infrastructure. The simple goal of delivering a single desktop experience across a multitude of devices and platforms can be easily achieved using VDI and by partnering with Mirus to deliver this solution. Moving away from procuring expensive end user hardware is something many organisations are now practicing, instead they are investing in server technology to simplify & secure the infrastructure and deliver a feature rich end user experience. Accessing your desktop profile from almost any device will increase productivity and communication with your organisation. With VDI, gone are the days where a user cannot work or retrieve files because their laptop or desktop has developed a hardware fault. Users can log into another desktop, internet browser or tablet device and continue working where they left off. Implementing a VDI solution will utilise your existing desktops and laptops, turning them into thin client machines, thus meaning the user isn’t reliant on the physical device. Mirus are VMware specialists having achieved a large collection of qualifications and accreditations, making us the perfect partner of choice to design, deliver and support a VDI solution. If you would like to speak to one of our consultants and allow them to demonstrate how this technology can benefit you, please do not hesitate to contact us. If you are interested in finding out more about the BETT Show 2014, any of the technologies that were there, or you have other plans for your School this year and could benefit from a ‘Sanity Check’ we’d love to hear from you. Please feel free to contact one of our Educational Specialists on 01908 257352 or read more about our experience in the ICT for Schools sector. Contact Adam Kirby or Peter Hack directly.